March 31, 2014 SCORE Dirt LiveHD show helps promote April’s SCORE Imperial Valley 250; Live drawing for start positions for race next Tuesday on SCORE Dirt Live... See More . . .
March 18, 2014 SCORE Dirt LiveHD show helps promote next month’s inaugural SCORE Imperial Valley 250; Official race course to be unveiled on Tuesday’s show ... See More . . .
March 18, 2014 Televised on CBS Sports Network World’s Foremost Desert Racing organization will present its first Southern California event in Imperial Valley, April 24-27, as El Centro area provides tremendous community support; SCORE International... See More . . .
March 17, 2014 SCORE Dirt LiveHD show helps promote next month’s inaugural SCORE Imperial Valley 250 SAN DIEGO—Both SoCal class winners from the race, Cody... See More . . .
March 10, 2014 SCORE Dirt LiveHD show helps launch 2014 SCORE World Desert Championship season SAN DIEGO—Mexico’s Gus Vildosola Jr along with SoCal’s Steve... See More . . .
March 4, 2014 Live SCORE Dirt LiveHD show helps launch 2014 SCORE World Desert Championship season SAN DIEGO—With all of the final touches put together in post production, tonight’s SCORE Dirt LiveHD internet show will feature special highlights... See More . . .
March 2, 2014 28th Tecate SCORE San Felipe 250 Round 1 of five-race 2014 SCORE World Desert Championship March 1—San Felipe, Baja California, Mexico (219.0 mi... See More . . . 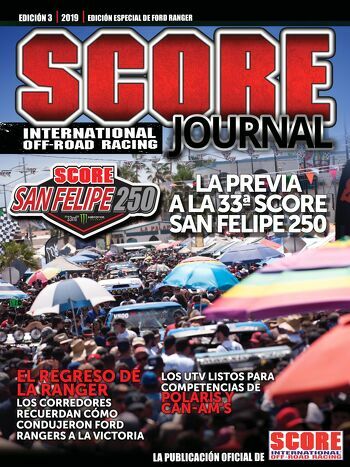 SCORE MEDIA CONTACT: Dominic Clark, dominiccnv@aol.com March 2, 2014 28th Tecate SCORE San Felipe 250 March 1, 2014 – San Felipe, Baja California, Mexico Po... See More . . .
March 2, 2014 April airing on CBS Sports Network Brabec/Esposito/Eddy capture overall Motorcycle victory on Kawasaki KX450F; Matney wins Class 1, other class winners include Celaya, Robinson, Jackson, Tornel, Connor, Sims, Rutherford, Awaad; Roger ... See More . . .
February 28, 2014 Race to air on CBS Sports Network 186 entries from 24 states, seven countries prepped for 274-mile race; Roger Norman era of SCORE Internation... See More . . .